Today’s enterprises are increasingly looking to upgrade security at the edge of their networks. This upgrade is not just to match higher network speeds with higher security performance. It is primarily designed to introduce a deeper level of inspection, beyond traditional port and protocol firewalls, for greater visibility into and control over network traffic. Enter the “next generation firewall,” a concept that continues to be extended in response to market forces such as the increase in SSL encrypted traffic. 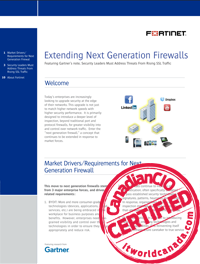 Register here to download the Gartner note, with additional recommendations from Fortinet.